I had the same as last week: Half a sweet potato with a piece of bacon, sausage, sautéed greens, half an avocado, and a green drink. The baby had eggs, avocado, and a green drink. I made some of these meatballs for my lunch and the baby’s lunch. Because I can’t each much dairy and she definitely can’t eat dairy, I left out the parmesan and also used almond flour instead of breadcrumbs. They were good, but definitely would have been better with the parmesan. I would definitely recommend adding the olive oil the recipe suggests. I was going to but forgot, and they were kind of dry. I had mine with a salad, and she had hers with peas, tomatoes, and sauerkraut. I caved (it was expensive) and bought one of the corned beef roasts from Trader Joe’s because I saw an Instant Pot recipe for it on their Instagram. It was pretty good. 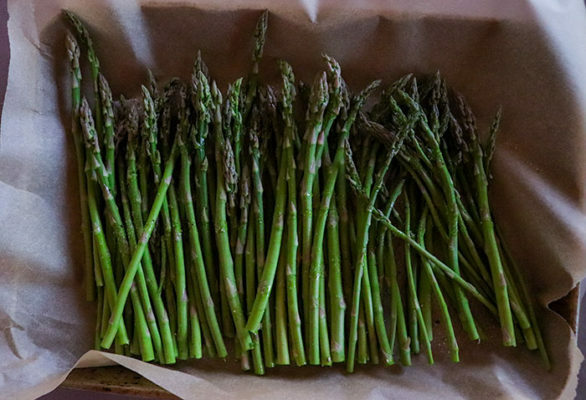 We had it with my roasted asparagus and herbed smashed potatoes from this blog! Our second dinner for the week is a recipe I’m working on for the blog. It’s a sheet pan pineapple chicken dinner. Still needs work! Hope you a have a good week!